Eugene Christopher Monroe was born April 18, 1987 in Plainfield. He was one of 16 kids (11 boys) born to Stephanie and John Monroe. Big and athletic throughout his childhood, Eugene stood over 6 feet tall and weighed more than 250 pounds when he became the star lineman for Clinton Jones’s Plainfield High Cardinals. Eugene earned All-State honors as a junior and senior, and did not allow a sack in either season. In 2004, USA Today, Parade and SuperPrep named him a High School All-American. One of Eugene’s teammates was receiver Donald Jones, who went on to star in college and the pros before a kidney ailment ended his career. As for Eugene, he was at the top of every college recruiting list. He picked the University of Virginia and played in every game his freshman year, often spelling D’Brickashaw Ferguson. Eugene had grown to 6’5” and close to 300 pounds, yet he had the great footwork and balance that separated the good left tackles from the great ones. And that is where he spent the rest of his college career for the Cavaliers. As a senior in 2008 he was named All-ACC and rated among the top blockers in the nation. 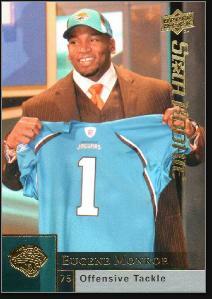 The Jacksonville Jaguars drafted Eugene with the #8 pick in the 2009 draft. He beat out veteran Tra Thomas for the starting left tackle job and anchored the Jabs’ line for the next four seasons. In 2013, Eugene was traded to the Baltimore Ravens four games into the season. Coming off a Super Bowl championship, Baltimore was struggling and needed to beef up its front line. Eugene was offered his uniform number from Jacksonville, 75, but opted for 60 because former Raven Jonathan Ogden had worn 75 for the Ravens during 11 Pro Bowl seasons. Eugene signed a multiyear deal with Baltimore prior to the 2014 campaign, but injured his knee early on and required surgery. He returned to the field at the end of October and started the final 11 games of the seasons for Baltimore. A second injury-plagues season—this time it was a concussion followed by a shoulder injury—limited Eugene to just 6 games in 2015. On the birght side, when he hurt his shoulder, he was playing some of the best football of his career, so the Ravens are hoping that he will have a big year in 2016.